In 2005, Kofi Annan, the former United Nations Secretary General unveiled a small green laptop in front of an audience in Tunis, Tunisia. The audience consisted of delegates from all over the world discussing the role of information technology in creating a better and equitable future for humankind. Kofi Annan then went on to tell the audience of the great promise this device held in advancement of social and economic development especially in the developing world particularly for school going children. Its 2012 and Kenya is at the height of its campaign period. The Jubilee coalition unveils its manifesto and one of the agendas under the education pillar is the provision of laptops to all children joining standard one. The project was set to kick off in January 2014. Legal hurdles emanating from tender rows led to delays in the Sh24.6 billion project. The tender committee had awarded the tender to Olive Telecommunications Pvt Limited. The other bidders including Haier Electricals Appliances Corporation Limited and Hewlett-Packard Limited(HP). The project stalled denying 1.3 million children their small green laptops. The government had initially identified 6,000 primary schools to pioneer giving over 400,000 students the devices. Each of the devices was set to cost Shs. 28,000. The second phase was to target 7,000 schools as was the third and fourth. The schools were set to receive four new laptops, two projectors and a printer for use by the teachers. Last week, the Standard published a lengthy article detailing the government’s plan to abandon the laptops for tablets. The paper stated that the government has factored into the 2015-2016 financial year budget the supply of the tablets at a cost of Kshs. 17 billion which is lower than the initial Kshs. 24 billion budget. It also states that an ICT firm based on Ngong Road in Nairobi identified to supply the tablets. I think tablets are a good idea. They are portable, meaning a child will not feel the effect of the weight. Some like the Kindle can hold up to 1,500 e-books which is a great resource for these children. Tablets also offer considerably longer battery life. Tablets are also becoming a core part of education. 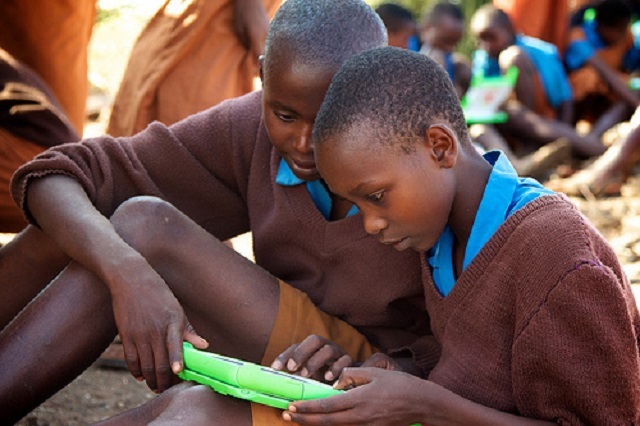 High cost schools in Kenya and around the world are already using tablets instead of textbooks in the classroom. This offers any child in Kenya an opportunity to interact with the best technology irrespective of background. Every year, the government releases millions of shillings to schools earmarked for textbooks to these schools. These textbooks are based on a standardized, public domain curriculum that can be easily transformed into free ebooks. According to a study by the Brookings institute, 3/4 of schools in southern African countries do not have basic textbooks. Even those that do have textbooks, the books are likely outdated resources. In some instances, the books may not be at the correct learning level, or relevant to the curriculum. With these devices, schools will have the ability to provide students with easily updatable devices that hold multiple books at once. An argument against the project has been teaching the school children how to use the tablet. Surprisingly, a recent experiment in Ethiopia allayed these fears. Nicholas Negroponte, founder of the original “One Laptop Per Child” project, gave Android-powered tablets to children, deep in a village in Ethiopia. Despite having never had any previous contact with high technology, within months children had used the tablets to teach themselves the English alphabet. The tablets are all about bringing such solutions to users who have never touched it before. If the government goes ahead with the tablets, the project might hit homerun. For one, the extensive connection to the power grid of primary school will provide a charging point for the devices. I also think, the tablets should come with a compression and acceleration technology that makes web pages load faster if they are internet enabled. I also hope the government plans to offer internet connection to these schools to not only teach kids to read and write but create an email account and even basic programming skills for those interested. The government could partner with Mark Zuckerberg through his internet.org initiative that seeks to whole world online. This would offer a cheap solution with regards to the provision of affordable internet to the tablets and schools at the same time. The initial cost of creation of the curriculum may be too high for both the government and the publishers. The curriculum is also reviewed constantly which makes it the most cost intensive part of the project. The other problem might be the government sourcing of the tablets. With the Shs. 17 Billion budget set for an estimated 1.3 Million tablets, this sets the budget at shs. 13,000 for each of the tablets without factoring in additional costs, this means they are probably low cost tablets with flimsy specifications and thus prone to many problems. Security of the devices is also a major problem. How will the tablets get replaced once lost? Where will the tablets be stored? Such are other issues to expect with the project. Distractions! Parents or siblings wanting to use the tablets for other purposes. I would imagine if the tablets have cellular capabilities, they would be used by the family to make phone calls. Wait until the children discover angry birds, subway surfers or Temple run and its downhill from there. Previously, the government abolished school fees for primary school children in 2003. This was accompanied by high enrollment into these schools. The government has built schools, provided meals and other intervention measures but the standards of education still remain at the lowest point. How about we try a different measure that involves technology? Technology keeps winning remember.